Ghozatloo, A., Yazdani, A., Shariaty-Niassar, M. (2017). Morphology Change and Structural ‎Evaluation of Carbon Nanostructures. International Journal of Nanoscience and Nanotechnology, 13(2), 97-104. A. Ghozatloo; A. Yazdani; M. Shariaty-Niassar. "Morphology Change and Structural ‎Evaluation of Carbon Nanostructures". International Journal of Nanoscience and Nanotechnology, 13, 2, 2017, 97-104. Ghozatloo, A., Yazdani, A., Shariaty-Niassar, M. (2017). 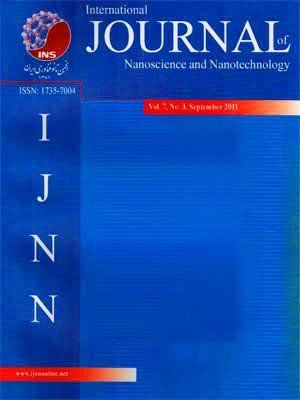 'Morphology Change and Structural ‎Evaluation of Carbon Nanostructures', International Journal of Nanoscience and Nanotechnology, 13(2), pp. 97-104. Ghozatloo, A., Yazdani, A., Shariaty-Niassar, M. Morphology Change and Structural ‎Evaluation of Carbon Nanostructures. International Journal of Nanoscience and Nanotechnology, 2017; 13(2): 97-104. In this study, the change of porosity and roughness of carbon nanostructures, including fullerenes, carbon nanotubes and graphene was investigated according to oxidation process. The effect of oxidation was more sensible on smoother surface of nanostructures. Oxidation increases surface roughness of graphene up to 5.2% and porosity up to 35.2%. While, roughness of hummers graphene is 13.1% higher than pure graphene. According to AFM results, oxidation can increase porosity and roughness of the surface. The amount of this increase is clearly a function of surface smoothness and multi-dimensional geometry of nanostructure. The functionalization processes have a positive effect on reducing the clustering phenomenon of nanoparticles and reduction of nanostructure particle size in their clusters that causes increases in surface porosity and roughness. So, functionalization processes can strongly change morphology of the nanoparticles in terms of structure, surface properties and geometry and according to these changes, nanostructures shows different behaviors. 1. Safi, M.A., Ghozatloo, A., Hamidi, A.A., Shariaty-Niassar, M., (2014). “Calculation of Heat Transfer Coefficient of MWCNT-TiO2 Nanofluid in Plate Heat Exchanger”, International Journal of Nanoscience and Nanotechnolog, 10(3): 153-162. 2. Ghozatloo, A., Shariaty-Niasar, M., Rashidi, A.M., (2014). “Investigation of Heat Transfer Coefficient of Ethylene Glycol/ Graphenenanofluid in Turbulent Flow Regime”, International Journal of Nanoscience and Nanotechnolog, 10(4): 237-244. 3. Chiang, Y., Lin, W.H., Chang, Y.C., (2011). “The influence of treatment duration on multi-walled carbon nanotubes functionalized by H2SO4/HNO3 oxidation”, Applied Surface Science, 257(6): 2401-2410. 4. Avilés, F., Cauich-Rodríguez, J.V., Moo-Tah L., May-Pat, A., Vargas-Coronado, R., (2009). “Evaluation of mild acid oxidation treatments for MWCNT functionalization”, Carbon, 47(13): 2970–2975. 5. Margetić, D., Štrukil, V., (2016). “Chapter 7 – Applications of Ball Milling in Nanocarbon Material Synthesis”, Mechanochemical Organic Synthesis, 3: 323–342. 6. Jabari Seresht, R., Jahanshahi, M., Rashidi, A.M., Ghoreyshi, A.A., (2013). “Synthesize and characterization of graphene nanosheets with high surface area and nano-porous structure”, Applied Surface Science, 276: 672-681. 7. Kuhlmeier, D., Rodda, E., Kolarik, L.O., Furlong, D.N., Bilitewski, U., (2003). “Application of atomic force microscopy and grating coupler for the characterization of biosensor surfaces”, Biosensorsand Bioelectronics, 18: 925–936. 8. VanderLee, M.K., VanDillen, A.J., Bitter, J.H., DeJong, K.P., (2005). “Deposition Precipitation for the Preparation of Carbon Nanofiber Supported Nickel Catalysts”, the American Chemical Society, 127: 13573–13582. 9. Park, O., Jeevananda, T., Kim, N.H., Kim, S., Hee, L.J., (2009). “Effects of surface modification on the dispersion and electrical conductivity of carbon nanotube/polyaniline composites”, Scripta Materialia, 60(7): 551-554. 10. Sathish, M., Miyazawa, K., (2012). “Synthesis and Characterization of Fullerene Nanowhiskers by Liquid-Liquid Interfacial Precipitation: Influence of C60 Solubility”, Molecules, 17: 3858-3865. 11. Lefrant, S., Baibarac, M., Baltog, I., Mevellec, J.Y., Godon, C., Chauvet, O., (2005). “Functionalization of single-walled carbon nanotubes with conducting polymers evidenced by Raman and FTIR spectroscopy”, Diamond and Related Materials, 14(3): 867-872. 12. Hontorialucas, C., López-Peinado, A.J., López-González, J., de, D., Rojas-Cervantes, M.L., Martín-Aranda, R.M., (1995). “Study of oxygen-containing groups in a series of graphite oxides: Physical and chemical characterization”, Carbon, 33(11): 1585–1592. 13. Li, C.C., Lin, J.L., Huang, S.J., Lee, J.T., Chen, C.H., (2007). “A new and acid exclusive method for dispersing carbon multi walled nanotubes in aqueous suspensions”, Colloids Surf. A: Physicochem, Eng. Aspects, 297: 275-281. 14. Tessy, T.B., Ramaprabhu, S., (2010). “Investigation of thermal and electrical conductivity of graphene based nanofluids”, Applied Physics, 108: 124308, 1-8. 15. Akhfash, M., Boxall, J.A., Aman, Z.M., . Johns, M.L., May, E.F., (2013). “Hydrate formation and particle distributions in gas–water systems”, Chemical Engineering Science, 104: 177–188. 16. Iglesias-Groth, S., Cataldo, F., Manchado, A., (2011). “Infrared spectroscopy and integrated molar absorptivity of C60 and C70 fullerenes at extreme temperatures”, Monthly Notices of the Royal Astronomical Society, 413(1): 213-222. 17. Lin, C.C., Kuo, C.L., (2013). “Effects of Carbon Nanotubes Acid Treated or Annealed and Manganese Nitrate Thermally Decomposed on Capacitive Characteristics of Electrochemical Capacitors”, Nanomaterials, 35: 1-8. 18. Kim, J.Y., Jang, J,W., Youn, D.H., Kim, H., Kim, E.S., Lee, J.S., (2012). “Graphene–carbon nanotube composite as an effective conducting scaffold to enhance the photoelectrochemical water oxidation activity of a hematite film”, RSC Advances, 2: 9415–9422. 19. Zhang, L., Wang, Y., Xu, T., Zhu, S., Zhu, Y., (2010). “Surface hybridization effect of C60 molecules on TiO2 and enhancement of the photocatalytic activity”, Molecular Catalysis A: Chemical, 331(1): 7-14.